For fast, reliable affordable sewer repair in Belleville, Illinois you can trust NuFlow St. Louis. Our sewer repair process is designed to provide high-quality, low-hassle results at a fraction of the cost of a traditional trench repair, so you can get back to your daily routine more quickly. 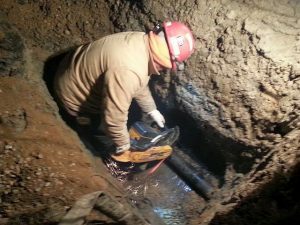 NuFlow St. Louis has been providing premium sewer repair services since 2012, and we have developed the experience and expertise to ensure a successful project no matter the situation. We know how to effectively handle difficult soil, poor accessibility, local Belleville regulations, and other factors that can make the sewer repair process more difficult or time-consuming. We also understand that you would rather not be dealing with the sewer repair process at all, so we do everything we can to facilitate a smooth, efficient project that doesn’t disrupt your activities any more than necessary. We always keep your satisfaction as our top priority, and we strive to create the value you deserve. To begin a sewer repair project, we perform a thorough sewer camera inspection of the interior of the pipes. Our expert inspection team carefully evaluates the conditions inside the pipe and investigates the extent of the damage. The team uses this information to prepare a repair strategy that fully corrects the problem in the most cost-effective manner possible, ensuring that you get a long-lasting solution without any unnecessary expense. Once we have a plan of action, we then clean the interior of the pipe with our advanced hydro jetting technology. The cleaning serves two purposes: First, it better exposes the surface of the pipe so that it can be checked for damage that was hidden beneath accumulated waste. Second, cleaning prepares a pristine surface for a variety of trenchless solutions that can restore the pipe effectively and affordable. With the pipe inspected and cleaned, we then move on to an application of the sewer repair solution. Depending on the spread and severity of the damage, we’ll apply an epoxy lining either with compressed air or by inserting an inflatable, removable sleeve with a coating that adheres to the inside of the pipe. Over the next several hours, the epoxy cures and forms an ultrahard surface that prevents leaks, while also resisting both rust and corrosion. The lining has a seamless construction that repels tree roots that would normally force their way in around joints in the search for water during drought. It also has a unique structure that is not prone to the micro-fissures that frequently occur during periods of extreme heat or earth tremors. Thanks to the epoxy’s smooth, strong surface, pipes lined by NuFlow St. Louis can last an additional 50 years or even longer. If you’re facing a sewer repair and want to make sure you choose a solution that provides lasting results at the most affordable rate, you need trenchless sewer repair by NuFlow St. Louis. Our technology leads the world in effectiveness and reliability, and we’re proud to bring it to our friends and neighbors in Belleville, IL. Call today!